Arnfinn Midtbøen, Gabriele Griffin and Dyveke Hamza discuss diversity programs. According to Midtbøen, academic institutions are not well equipped with leadership able to address diversity issues (Photo: Nordfosk/Terje Heiestad). Podcast: Can good leadership solve academia's gender and diversity problems? “No one wants to hear that they’re racist or sexist,” says Frank Dobbin. He is a professor of sociology at Harvard University and has studied diversity programmes in US corporations. On 9 November, he spoke at the conference Creating a competitive edge through diversity - leadership for Nordic research excellence towards 2030. Dobbin has explored what works, and what does not work, when corporations are striving to promote diversity and gender equality. Even if many types of diversity training do not work, Dobbin argues that harassment training does. This is because the training focuses on how to manage harassment, and not the leader’s own attitudes. “You can’t get rid of implicit bias with implicit bias training. But that is what companies spend all their money on,” he continues. In the article “Why Diversity Programs Fail”, Dobbin argues that positive measures such as mentor programmes and active recruitment might help to enhance diversity and gender balance, whereas policing and punishment might not. The overemphasis on implicit bias is not the key to solving the bias problem. If you give people a new responsibility, they are likely to do the job. Dobbin has seen how this works for active recruitment. In the panel discussion after Dobbin’s talk, sociologist Arnfinn Midtbøen from the Institute of Social Research pointed out a problem in the discussion about diversity. He points to the fact that academic migrants, refugees with academic qualifications and children of immigrants all comprise the target group when institutions want to recruit a more diverse staff. Dyveke Hamza, the head of human resources at the law firm Haavind, is worried about the academic institutions that fail to attract minorities. Well equipped for diversity management? Midtbøen is worried about the leadership structure in academia. Heads of departments are elected, and often newly recruited to the institution they are hired to lead. They do not necessarily have leadership experience or training. Frank Dobbin agrees, and sees the leader’s role as crucial. Professor Gabrielle Griffin of the Centre for Gender Research at Uppsala University wants us to consider not only the management, but also the academic content of the research institutions. Dobbin is Professor of Sociology at Harvard University. He is the co-author of the article “Why Diversity Programs Fail”, winner of the HBR McKinsey Award for the best Harvard Business Review article of the year. On 8-9 November 2017, The Committee for Gender Balance and Diversity in Research (KIF Committee) organized a Nordic conference on diversity and equality in research. NordForsk supported the conference. 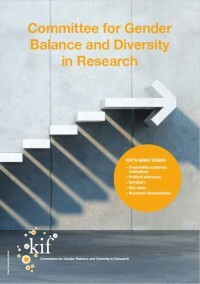 Read their article: How can we improve the gender balance in academia? In connection to the conference, the KIF Committee published a policy brief summing up it’s work and pointing to challenges and opportunities ahead. reader-friendly version and printer-friendly version. The podcast is based on Dobbin’s lecture at the conference, as well as the panel discussion featuring Midtbøen, Griffin and Hamza.